Bite-Sized: Lost Arts | Wake up, Meeples! Many types of terminal actions can be made much better by tacking on +1 Action. 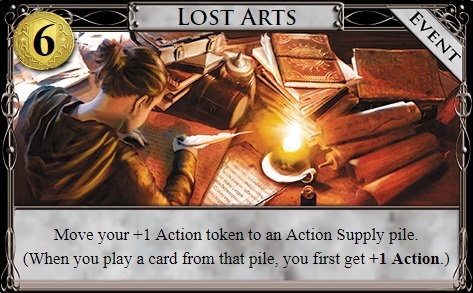 The most common synergy with Lost Arts is putting it on a terminal draw card. This is very strong because you no longer need to line up a village with your draw card, and you get all of your draw up front. This leads to decks that can be built much more efficiently and end up being much more consistent; drawing your deck at this point becomes trivial. You can also put Lost Arts on terminal payload cards, even weaker ones, to make spamming these cards a valid strategy, even without any other support. This entry was posted in Bite-Sized, Dominion, Tabletop Games on April 5, 2019 by Adam Horton.